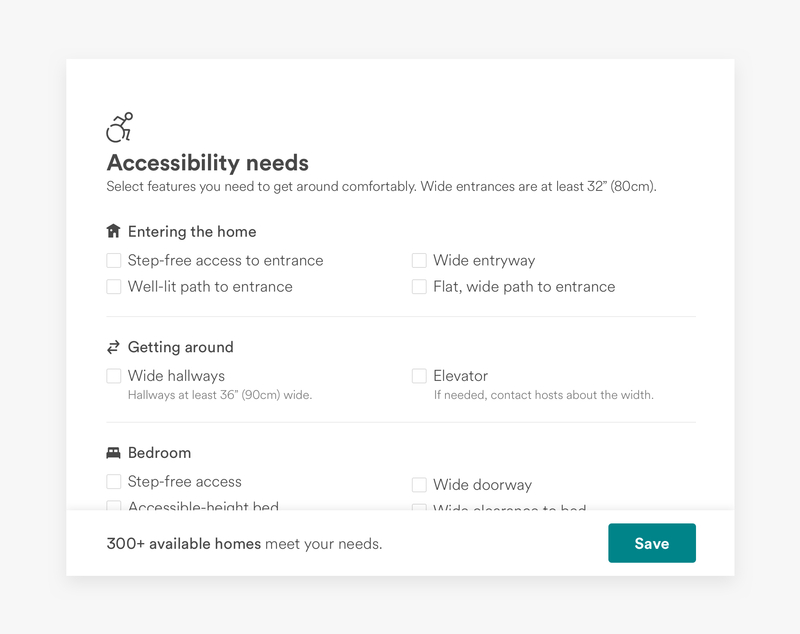 Editor’s note: Last year, we started designing features with a goal of making Airbnb more inclusive for community members with disabilities. To build upon this foundation and strengthen our commitment to making Airbnb an accessible way to travel, we recently acquired Accomable. As designers and researchers, it’s our job to know our community and its needs. Focusing only on most or some of our guests goes against our company’s vision of creating a world where everyone can belong. To design effectively, we need to continually question our assumptions and find ways to remain aware if and when our solutions don’t work for everyone. We recognized we weren’t effectively designing for people with disabilities. In humbling conversations with travelers with disabilities and advocacy groups, we started to hear their stories, gain perspective, and learn how to do better. We quickly learned that our previous solution — a single “wheelchair accessible” option to filter for accessible homes — failed to meet their needs. Guests weren’t getting the information they needed to find the right homes, nor the confidence that the home they selected would actually be accessible for them. To help address this problem, we’ve been working on a new “accessibility needs” feature. In collaboration with our community, we’ve identified a set of features that can make a home a better fit for people with disabilities. These features include step-free entry to rooms, entryways that are wide enough to accommodate a wheelchair, and more. Guests can now select features they need in a home: wide doors and hallways, step-free access, and specific features in each area of the home. We also give hosts the tools to be more descriptive about their home’s accessibility, and our hope is guests will have the confidence and clarity to find the right home for them. We’re now beginning to roll out this new feature to guests on the web. iOS and Android will follow over the next few months. Solving these kinds of problems are crucial to Airbnb’s mission to help anyone belong anywhere. To address this, we banded together a small, passionate group of researchers and designers. We began by talking to travelers with a range of disabilities to better understand their needs in a place to stay. Our previous filter, a single checkbox labeled “wheelchair accessible,” offers no explanation of what accessibility features a home has. We found that every time these travelers searched for accommodations — whether through Airbnb or elsewhere — they had to contact the host or hotel about specific accessibility features that might not be listed on their website or app. In some cases, we discovered that listings marked as “wheelchair accessible” on our platform didn’t always provide all the features needed for some of our guests, and that this miscommunication stemmed from either too few accessibility feature options or unclear feature descriptions on our platform. The needs of our travelers vary widely — for instance, some absolutely need accessible bed heights, others are comfortable with a few steps at the front door, and some are okay with bringing their own shower chair if need be. With our learnings in mind, we iterated on how guests would interact with Airbnb to find a place that meets their needs. These new features require many different options for different people, and it was a balancing act to find a flow that aligned with the simplicity of the Airbnb platform. New filters allow guests to indicate that they need wide clearances or step-free access in each area of a home. By creating prototypes and testing them with travelers with disabilities, we were able to land on a simple interaction. Our initial iterations had only one checkbox that specified whether or not all doorways in a home were 32 inches. We learned that some guests would only need options like this in essential spaces, like a bedroom and a bathroom. Because requiring that every room in a home have these features could prevent guests from finding homes that fit their needs, we updated the design to allow these options to be chosen by room. When we made this change, we also decided to include “common areas” as one of the essential spaces. This was an important addition as we’d heard stories of travelers being separated from their families or friends when a common space wasn’t accessible to them. Guests can select which accessibility features they need in each area of the home. We also defined a set of features specific to each room. Travelers can choose to have a roll-in shower, or a bed that’s at the right height for them. Every feature is an individual option, and each one describes the home – not a specific disability. Through our conversations, we learned that a common concern for travelers with disabilities is whether or not Airbnb hosts are knowledgeable enough about these accessibility features to specify that their home is equipped with them. To ensure that our hosts are able to accurately review their home, we added detailed descriptions and measurements for each feature. We interviewed a number of hosts to make sure these descriptions are helpful, and that they feel confident to accurately apply them. Hosts are provided with detailed descriptions so they can accurately specify the accessibility features of their home. “Step-free access,” shown in this example, means there are no steps to get into the room and the entryway is level. These descriptions were written to be inclusive of a range of accessibility needs. Any given feature may be useful to a variety of people. We avoid assuming what kind of disability a feature may apply to – instead, we gather information from hosts and pass it on to guests to make their own selection. This process has been an amazing learning opportunity for us as designers and researchers. These improvements aren’t a final solution: they are the start of an ongoing conversation with the community. With our acquisition of Accomable and their expertise in this space, we hope that these conversations will be even more fruitful. Creating with the long term in mind is a key component of the way we work. When designing new ways to help travelers with disabilities find a place to stay, we aim to build a vision for the future, not just a short-term fix. We’re looking forward to implementing quicker and easier ways for hosts to update their homes’ accessibility information, and hope to increase guests’ confidence that these homes will fit their needs. As a company, we connect people with unique homes. Our hope is that, as we work to improve the accessibility of these homes across our platform, we will keep progressing toward our goal of helping anyone belong anywhere. Nanako Era is an Experience Researcher at Airbnb. She’s obsessed with dogs and eggs. Jake Hytken is a Disability Consultant in Tech, working with Airbnb on content strategy and advocacy. Jake can be slowed down, but it’s your toes that will get run over in the process. For everyone’s sake, let Jake take the wheel. Chris Arvin is an Experience Designer at Airbnb. He likes going to donut shops (i.e., Donut Savant), nerding out about public transit, and hugging his cat.